We recommend that when you purchase a dehumidifier you also purchase an accurate method for checking the humidity and temperature in the room. All of the models of dehumidifier that we recommend already include this function but the level of accuracy of a precise purpose made scientific instrument will help you to get the most out of your main purchase. Humans are notoriously bad at estimating temperature and humidity levels which is why knowing the exact levels that you find comfortable help you to set the controls on you Mitsubishi Dehumidifier. This practical instrument measures permanently the room air conditional and shows the air temperature and the humidity in large letters on the display. 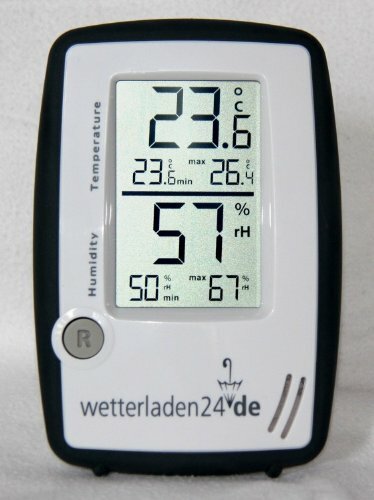 The hygrometer instrument was developed to monitoring the conditioners. You can monitoring the deepest and the with one automatic and one manual memory. The instrument has a very good display. The display is precise and easy to read. In many living rooms is the humidity to low, but in some basements or storages to high. The instrument is monotoring your rooms and warns you for unhealty breating air and mold-danger in to wet rooms. It memories also the min- and maxworths, so that you know, how the worths rise and sink in the night. Display of min- and maxworths with automatic timed reset. Display of min- and maxworths with manually reset. Display-instrument for table standing (Stand) or wall-fixing suitable. 1 battery 1,5 V, LR3 included. Mitsubishi Dehumidifier MJ-e16VX Precise and powerful Triple filters allergens and dust Laundry Mode Suitable for 5 bedroom home.. This practical instrument measures permanently the room air conditional and shows the air temperature and the humidity in large letters on the display. The hygrometer instrument w.. The Mitsubishi Dehumidifier MJ-e16V Suitable for a five bedroom home. Quite, sleek, efficient. Portable Only 18cm deep Award winning design ..